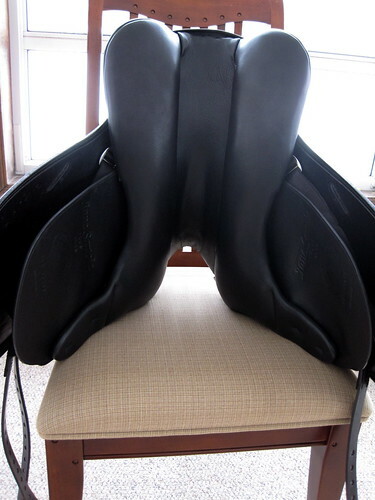 Check out my (half) new saddle!! Sorry about not posting the pictures yesterday, I was out having some birthday fun! The roads were totally fine, but I ran out of time to see the boys (which I am totally regretting because it is snowing like crazy right now and the roads are not so good anymore) and by the time I got home it was dark out, which is not so good for pictures. 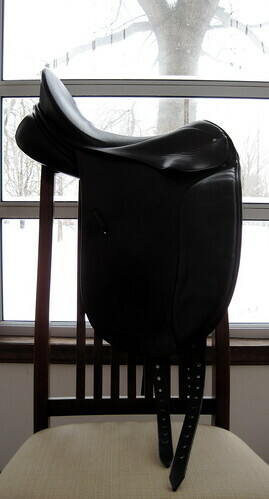 So now, without further ado, here are the pictures of my saddle! 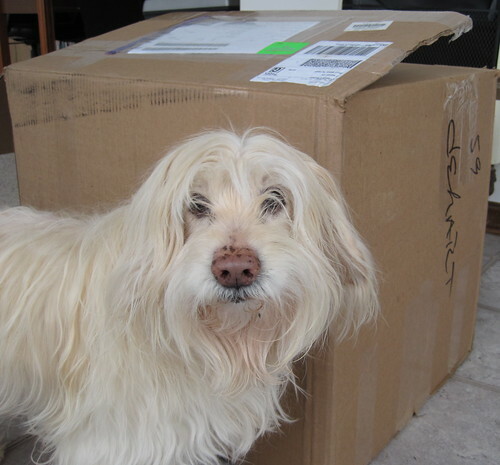 Here is the box it came in. I had to take a picture of it with my doggy Coco in front (she is 17 next month!) just to show you how big it was! 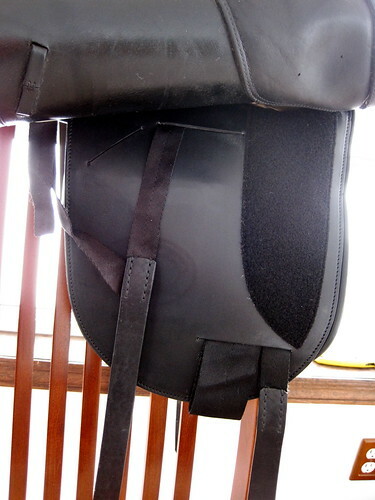 Here is the side view, which doesn’t look very different at all because that is the top half of my saddle, which did not have any work done to it. Sorry about the lighting…obviously snow is a bit on the bright side! Here is the whole new underside. It feels so soft and amazing! The changes are not as dramatic as I thought they were going to be. The cuts on the shoulder are hard to even see, and while they did take some of the length off the back and widened it, the untrained eye would not be able to see that much of a difference at all. Now where you can see the big difference. 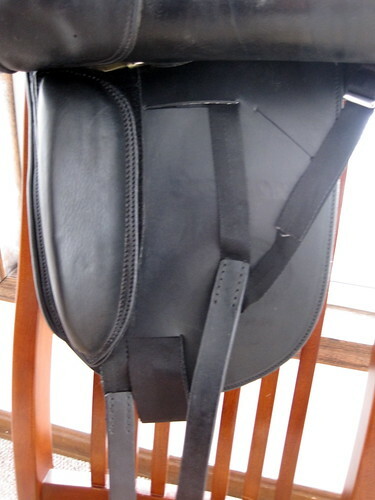 My billets before were pointed back and that is how my saddle used to be balanced. With this new underside my billets now pull straight down (which is much more common) and my saddle has been totally rebalanced. Also, check out the area where my thigh block goes. It is VELCRO! How cool is that! I can now change the size of my thigh blocks whenever I feel like it! This is my giant thigh block. Someday I hope to not need that much saddle support and now, when they day comes, it will not be a big deal at all to make a change. It was so easy to attach the thigh block. I literally just lined it up and put it on. 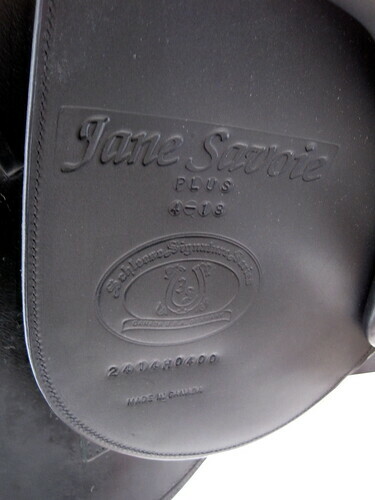 This is the newly stamped underside. 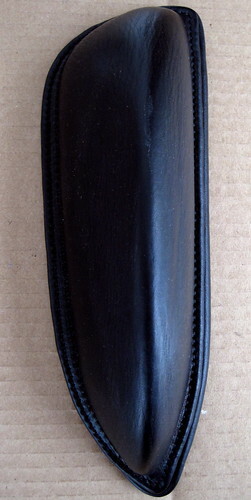 Gone is the name of the original saddle owner. This really is my saddle now! 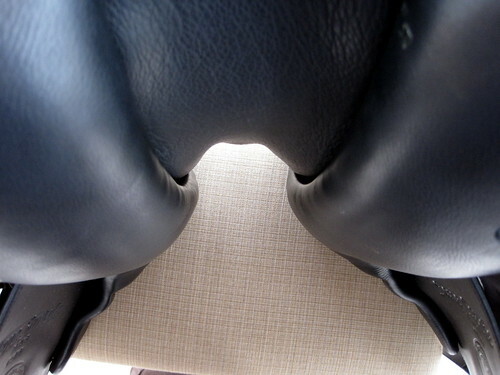 The big difference between Phoenix’s left and right sides is still just as obvious in the new saddle. Sometimes I wonder how on earth he is so freaking uneven! I mean look at that…just look at that! So after spending all that money, going 5 weeks without riding Phoenix I am really hoping that this was all worth it! Once I get a break in the weather I am so going to try it out! 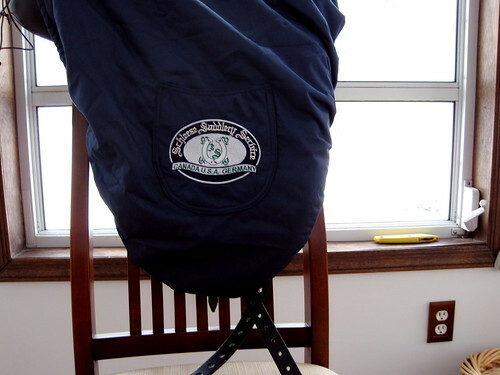 For all I know right now I may have just spent a lot of money on a saddle cover!